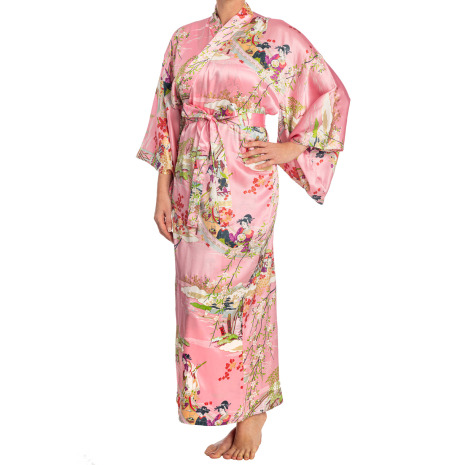 The Silk Ukiyoe Print Long Pink Japanese Kimono is a really beautiful pink full length, pure silk, authentic Japanese kimono (or yukata) with a stylish floral print. Made in Kyoto in the same style as a traditional Japanese kimono with full cut sleeves, which can be used as pockets, it is typically worn left over right and loosely tied off using the matching sash or obi provided. The Silk Ukiyoe Print Long Pink Japanese Kimono is extremely elegant and gloriously soft to the touch, perfect for relaxing in at home or on holiday! If you are looking for a gift for a loved one or a special treat for yourself, this luxurious Japanese kimono is guaranteed to impress! Size: 140cm / 55 inches long, ideal for ladies UK dress size 12 to 18 and over 163cm / 5 feet 4 inches tall. Order your Silk Ukiyoe Print Long Pink Japanese Kimono online today and visit our showroom for this and many more Japanese silk kimonos! 3 Simple Kimono Size Options! Suitable for ladies size 8 to 14 and any height. Square cut sleeves with a small pocket on the front. Designed to fall between the knee and the calf. Suitable for ladies size 12 to 18 over 5'4" (163cm) in height. Traditional Kimono style open cut sleeves, which were traditionally used as pockets. Designed to fall on or above the ankle, but can be shortened if required. Suitable for ladies size 16 to 22 over 5'4" (163cm) in height. Kimono style open cut sleeves, which were traditionally used as pockets. Thank you for the swift delivery of the Kimono, it's beautiful!